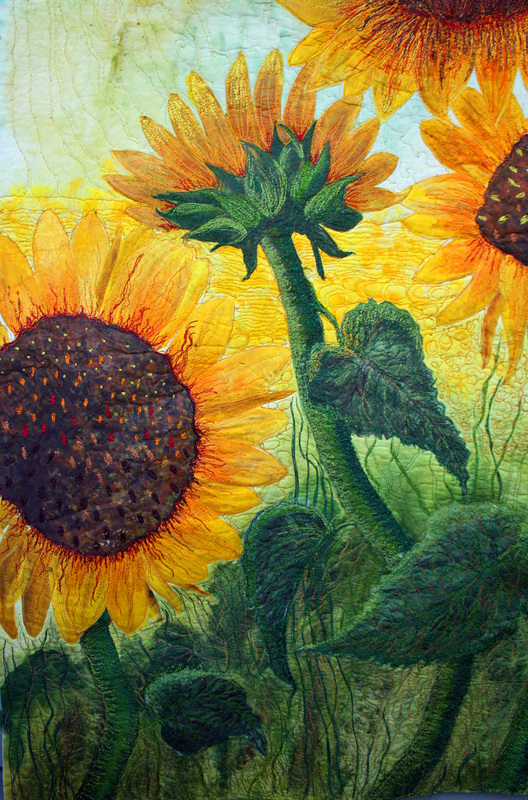 I love the use of nature as a subject in your quilts. I also love the use of vibrant colors. My favorite one is the octopus ocean scene. I don’t know if my comment went through Sophia, so if you see 2 that’s why. But thank you again for your kind words. I love color and usually use it very heavily, I’m an addict. I had a really fun client who commissioned the octopus quilt, it was so fun to do. Thanks for your comment Sophia. I really love the use of nature as a subject in the quilts. I also love the vibrant colors that were used. Thanks so much. I am a color junkie for sure. I do a lot of abstracts and they are drenched in color. I love flowers and natural themes too, even stylized florals are a real passion of mine. Thank you for your nice comment, I am a color addict, as you night have guessed. Thank you much for your comment. I saw your art in a magazine this past week – I so love the Hope is a thing with feathers – art quilt – I love all of your work but that one was just so incredibly wonderful I rate it as first on my list. I am an artist but never in material – it is amazing to me how you do it! I just wanted to tell you. Kathy, That wasn’t me. It might have been Betty Busby, I think she has a piece with that name. Thanks though. Kathy You mentioned you are an artist, what is your prefered medium? I started with watercolor many years ago and some oils. It’s interesting how our medium can change over the years, but the love of art never does. Regarding- Everything under the sun…Hello Barbara. your work is BEAUTIFUL! I am looking for a horizontal piece to mount, like canvas, behind mu couch..the colors in your sold “Under the Sun” piece are perfect! Do you have anything nearing completing that may be similar? Thanks Kristin. I sent you a email regurding. So glad you like it.